May is National Salad Month and I want to share one of my new favorite dishes to make: Golden Beet Tartar. I took a cooking class with Fabio Viviani (Top Chef season five fan favorite) and he made a Beet Tartar that inspired me to create this version. 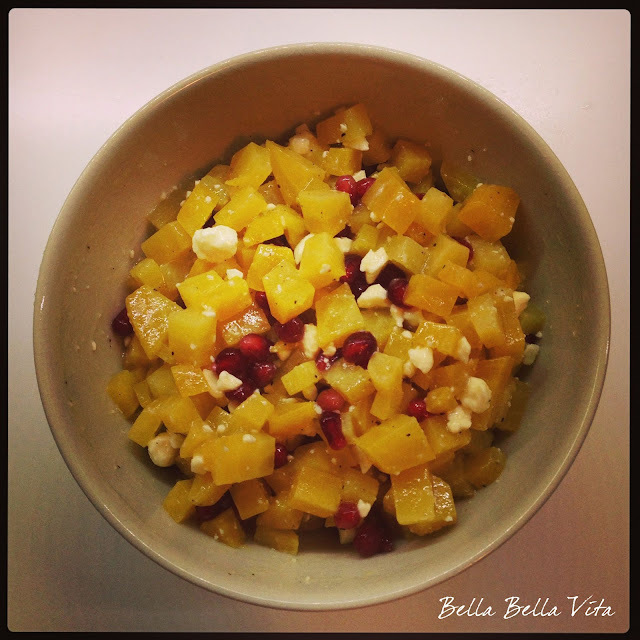 I love feta cheese to enhance a dish and pomegranate seeds add such beautiful color and flavor. Note: I used the white balsalmic vinegar from Ferrari Olive Oil Co., one of my favorite olive oil and balsalmic vinegar stores in Studio City. It is simply divine. Wash beets and place each one on separate tin foil squares. Spray or drizzle with olive oil and wrap in tin foil. Roast at 425 degrees for approx 45 minutes until tender. Allow to cool and then peel. I find it easer to peel the beets once they are roasted. Once completely cooled, finely dice beets and put in a bowl. Add feta cheese and pomegranate seeds and toss. I don't add too much feta or pomegranate, just enoughto season and give color. Whisk together the white balsalmic vinegar, olive oil, salt and pepper. Toss with beets and let stand 5 minutes before serving.